Down With Quebecs Niqab Ban! We reprint the following article from Spartacist Canada No. 165 (Summer 2010), newspaper of the Trotskyist League/Ligue trotskyste, Canadian section of the International Communist League (Fourth Internationalist). The Catholic church anathematizes those who transgress its edicts. So too the Quebec government, the Canadian prime minister and the leader of Her Majesty’s Loyal Opposition [federal Liberal Party’s Michael Ignatieff]. They have decreed that fully veiled Muslim women are anathema, to be denounced and hounded out of social life. On March 9, 29-year-old Naema Ahmed was dragged out of a French language exam by an official from Quebec’s immigration ministry because she refused to remove her niqab, a veil that covers most of the face. The young woman, an Egyptian immigrant, pharmacist and mother of three, had enrolled in this community centre class following her earlier expulsion from Cégep St. Laurent [a junior college] for the same reason. Again the authorities tracked her down. “I feel like the government is following me everywhere,” she said. Soon after, a 25-year-old Indian immigrant, Aisha, fell victim to this xenophobic persecution, and was driven out of a French class by the same government department that put her there five months earlier. On March 24, Jean Charest’s Quebec Liberal government codified its racist drive against Muslim women with Bill 94. This law would ban women wearing the face-covering niqab or burqa from receiving any government services, and would bar them from all public-sector employment. This is a green light for racist abuse. Denied schooling, health care and perhaps even access to public transit and many other essential services, these women will become virtual prisoners in their homes—a Canadian version of purdah. While the number of women who would be impacted directly is small—at most a few dozen—the effects will be felt throughout the Muslim population and beyond. There was a brief outcry in the English Canadian press against Bill 94, as bourgeois editorialists found it a convenient club with which to bash Quebec. The message, stated openly or implied, was that Quebec nationalism is uniquely intolerant, unlike the “multicultural” harmony that supposedly reigns elsewhere. Once Bill 94 was embraced by Conservative prime minister Stephen Harper and federal Liberal leader Michael Ignatieff these mostly hypocritical voices fell all but silent. For over a decade, the capitalist ruling class has whipped up anti-Muslim racism, the domestic fuel of the “war on terror.” This has seen countless frame-ups, detentions, people “rendered” to other countries to be tortured and a sustained assault on the rights of everyone. As an extension of the “war on terror,” veiled Muslim women have been repeatedly scapegoated. In 2007, the all-party outcry against letting fully veiled Muslim women vote in federal elections without baring their faces was a gratuitous instance of racism. The impact of the rulers’ demonizing of Muslims is shown by the broad support for the niqab ban: according to polls, 95 percent of Quebec residents support it, as do 80 percent across the country. Bill 94 is cut of the same cloth as the laws being enacted in many European countries where the oppressed Muslim minority suffers the daily humiliations of racism, segregation and police violence. In Belgium, a bill which could become law this summer makes wearing full-face coverings in public spaces punishable by fines or jail. In an Italian city whose mayor is from the far-right Northern League, a woman was fined 500 euros for wearing a burqa. France has banned the hijab (headscarf) in schools since 2004, and in May the French parliament voted a resolution against full-face coverings. We Marxists fight for the liberation of women, and thus oppose the veil, no matter what form it takes, as both a symbol and an instrument of women’s oppression. We stand with the many women who seek to escape the cruel tyrannies of religious traditionalism, from the veil to the bride price and arranged marriage. But all these government bans and restrictions on the veil are racist and discriminatory against Muslims, and we unambiguously oppose them. The claims that banning the veil will foster women’s equality or integrate Muslims into society are transparently false. The reality is that these bans mean the expulsions of Muslim girls and women from schools, universities and the workforce, deepening their isolation and oppression. The current state-sponsored persecution of Muslim women follows the 2007 wave of bigotry against young Muslim girls in Quebec that saw several driven out of sporting events because they wore the hijab. Bill 94 is the Charest government’s answer to the question of how far “reasonable accommodation” of religious minorities should extend. To even pose the question in this way is to invite a racist backlash. In pushing the niqab ban, the Liberals, the bourgeois-nationalist opposition Parti Québécois [PQ] and a range of bourgeois feminists say they are upholding secularism and women’s rights. Quebec is easily the most secular part of Canada, a legacy of the struggles of the 1960s and early ’70s that threw off the shackles of the Catholic church. The deep oppression of Québécois women was sharply undercut, and it was in Montreal during this period that Dr. Henry Morgentaler began his long and courageous battle to overturn Canada’s reactionary abortion laws. But the forces pushing Bill 94 today are cynically manipulating the broad support for secularism and women’s rights in Quebec to pursue reactionary aims. Opposition to national oppression fuelled explosive class and social struggles in Quebec in the 1960s and ’70s. Yet the outcome of these struggles was that the working class, lacking a revolutionary proletarian leadership, was drawn into the political framework of bourgeois Quebec nationalism. Like the “pro-Canada” chauvinism pushed by the labour tops and NDP [social-democratic New Democratic Party] in English Canada, such nationalism inevitably fosters racism against immigrants and ethnic minorities. Recognizing that the working class of this country is deeply split on national lines, undermining its ability to wage anti-capitalist class struggle, we Marxists advocate independence for Quebec. By taking the national question off the agenda, this would create far better conditions for the workers to see that their real enemies are their “own” respective capitalist exploiters—not the workers of the other nation or ethnic and racial minorities. The ban on services to fully veiled Muslim women is the most recent face of the racist crusade to keep such minorities “in their place.” It has absolutely nothing to do with the separation of church and state, which we Marxists uphold. We oppose state subsidies for churches through tax breaks, as well as all state funding of religious schools and religious instruction in the public schools. When there was a move in Ontario several years ago to give legal standing to Muslim sharia courts we sharply denounced this (see “No to Ontario’s ‘Sharia Courts’,” SC No. 142, Fall 2004 [reprinted in WV No. 836, 12 November 2004]). But we are also against state interference in private religious practices, which the ruling class uses to whip up hatred against minorities. The danger to women’s rights comes not from a tiny, vulnerable Muslim minority, but from the rule of the bourgeoisie, which upholds the reactionary institution of the family, the central force that oppresses women the world over. The family is the vehicle for transmitting property from one generation to the next, and the mechanism for raising new generations of workers. Bourgeois family law is thus tightly bound up with defense of private property, and women’s inequality is always reflected in the legal and social codes of every society. Even in the advanced capitalist countries where women have achieved a measure of formal equality, women’s oppression cannot be legislated out of existence. This oppression originates in class society itself and can only be rooted out through the destruction of private property in the means of production. The family unit cannot simply be abolished; its functions must be replaced with socialized childcare and housework in an egalitarian socialist society. Just as Harper embraces the ban on niqab-wearing women, he and his federal Tory government are ratcheting up the war on abortion rights. Like true Colonel Blimp colonialists, they have announced a “foreign aid” plan ostensibly designed to improve maternal health in the Third World that denies any funding for abortion. Millions of women around the world suffer unwanted pregnancies and die in childbirth, and a major cause of female mortality is botched “back-alley” abortions. But this is of no concern to Harper and the anti-abortion fanatics, who have been emboldened by his stance. Harassment of women outside abortion clinics has increased, and on May 13 some 15,000 people rallied on Parliament Hill calling for the banning of abortion. Heavily mobilized by the Catholic church, the rally included a raft of MPs from the Tory and Liberal caucuses. Down with anti-abortion reaction! For free abortion on demand! The increased prevalence of the Muslim veil today is in part due to the rise of political Islam internationally. It is also a result of the relentless racism, poverty and hardship suffered by Muslim immigrants and their descendants in Canada and other imperialist countries. In the segregated immigrant communities, all the reactionary “traditions” are preserved through ties to the homeland. Young immigrant and minority women are trapped between the racism of these societies and oppressive, rigid family strictures. Unable to find jobs that provide financial independence, life for them is an endless saga of miseries. We Marxists fight for the voluntary integration of all minorities based on full equality. The eradication of racism, women’s oppression and all forms of discrimination requires a revolutionary struggle, mobilizing the power of the multiracial working class to uproot capitalism and liberate humanity from poverty and want. This perspective is sharply counterposed to the “multiculturalism” propounded by the Canadian rulers and the reformist left, which promotes illusions that the capitalist state can be used as an instrument to fight racist oppression. This state exists to defend class rule based on private property; it is used by the capitalists for the suppression and exploitation of the working class. The supposedly liberal program of multiculturalism strengthens the hold of “community leaders,” with their ties to mosque, church or temple, and it denies that minority communities, like the rest of society, are class-divided. The struggles of immigrant and other minority workers for jobs, unions and equal status require breaking the grip of religious and other conservative community leaders. To justify the persecution of Naema Ahmed, Quebec’s minister responsible for the status of women, Christine St-Pierre, invoked the bloody imperialist occupation of Afghanistan: “There are people in Quebec, in Canada, and other countries around the world, who have gone to Afghanistan and spilled their blood so that these things won’t be tolerated” (Globe and Mail, 10 March). The ban on the niqab has as much to do with women’s liberation as the NATO occupation of Afghanistan does, i.e., nothing. The U.S. and Canadian imperialists and their apologists have used the brutal oppression of Afghan women under the former Taliban regime as a justification for the neocolonial occupation of that country. But the anti-woman Islamic cutthroats came to power there in the early 1990s with the support of U.S. and Canadian imperialism, as well as that of the NDP social democrats. And today’s U.S. puppet regime in Kabul continues and upholds the same hideous oppression of women. U.S., Canada, NATO: Get out of Afghanistan now! When there was a real possibility of liberating Afghan women, the U.S. and Canadian imperialists were on the other side. In the late 1970s, when a modernizing Afghan government moved to implement modest reforms for women such as lowering the bride price and instituting education, the tribal mujahedin (holy warriors) erupted in violence and terror. To protect its borders from the fundamentalist threat, which was already backed by the CIA, in late 1979 the Soviet Union sent its Red Army into Afghanistan at the invitation of the left-nationalist government in Kabul. The U.S. government spent billions to fund the mujahedin’s holy war against the Soviet Union in what was the biggest CIA operation in history. We declared “Hail Red Army!” and called to extend the social gains of the October 1917 Russian Revolution to the Afghan peoples, especially the terribly oppressed women. Sending the army to clean out the reactionary insurgency opened a road to liberation for the Afghan peoples. It underlined our Trotskyist understanding that the Soviet Union was a workers state, product of the October Revolution, despite its later degeneration under a nationalist, Stalinist bureaucracy. The liberating effects of the Soviet intervention were measured in hard statistics. In 1988, women made up 40 percent of the doctors and 60 percent of the teachers at the University of Kabul; 440,000 female students were enrolled in educational institutions and 80,000 more in literacy programs. Western dress was common in the cities, and women enjoyed a real measure of freedom from the veil and subjugation for the first time in Afghan history. But rather than fighting to defeat the CIA-backed fundamentalist forces, the Kremlin Stalinists under Mikhail Gorbachev criminally withdrew the Soviet troops in 1989. This was a huge betrayal of Afghan women, workers and leftists. It paved the way for the triumph of Washington’s woman-hating cutthroats, and for handing the Soviet Union itself over to counterrevolution two years later—a colossal defeat for the workers of the world. Reactionary ideas take hold and grow in reactionary periods. Especially since the counterrevolutionary destruction of the Soviet Union, there has been a rise of fundamentalism of every kind: Protestant fundamentalism in North America; Orthodox Jewish fundamentalism in Israel; an ever greater reach by the Catholic church into social life in Europe; Islamic fundamentalism in the Muslim countries and in imperialist centres with large Muslim populations. All the variants of the “opium of the people,” as Marx called religion, are freely disseminated. The growth of this false consciousness is rooted in despair and the lie that class struggle and authentic communism are no longer possible. Only Socialist Revolution Can Liberate the Oppressed! The “war on terror” pursued by the imperialist rulers is a classic “divide and rule” ploy, stigmatizing Muslims as an excuse for a sweeping reduction in the legal rights of the entire population. It is also aimed at the working class, intended to stifle class struggle by insisting on “national unity” against a supposed common enemy. The “war on terror” must be fought by mobilizations of the multiethnic working class. Workers across the country are paying for the capitalist economic crisis with their jobs, livelihoods, pensions and health care. In Quebec, Charest has launched a large-scale assault on public-sector workers and social services, provoking large labour protests. In contrast, protests against Bill 94 have been tiny. Far from opposing the ban on public services for women wearing the niqab, the leadership of Quebec’s largest union federation, the FTQ, publicly supports it, stating in a brief to a government committee: “The FTQ entirely endorses this policy, which seeks to ensure normality in communications between individuals, security and identification during the provision of public services” (ftq.qc.ca, 20 May). The persecution of Muslim women—who are among the most oppressed in society—is poison to labour’s battles. Struggling for class unity, workers must oppose Bill 94 as well as all the racist anti-immigration laws and fight for full citizenship rights for all immigrants. Muslims and other minorities make up a growing part of the working class in Montreal, as well as Toronto and some other cities. To win against the bosses requires defending the unity of the working class against racist demagogy. “This perspective requires a tremendous leap in social development, which can only be achieved through sweeping away capitalist rule on a global basis and replacing it with a rational, democratically planned economy. 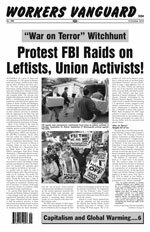 Protest FBI Raids on Leftists, Union Activists! All Indian and Pakistani Troops Out Now! Down With Indias Bloody Repression in Kashmir! For an Internationally Planned Economy!